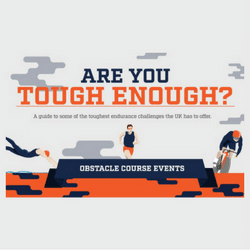 Home » Our Blog » Obstacle Course Events: Are You Tough Enough? Obstacle Course Events: Are You Tough Enough? Thinking of getting fit but need a challenge to really motivate you? Or perhaps you just want to test your fitness against some of the toughest challenges the UK has to offer. Then perhaps you’d like to look through this guide to find out what event will suit you best. The guide below includes some of the UK’s biggest and best endurance races that are open for all to enjoy. There are assault courses that will get you muddy, extreme swims, brutal cycles and runs that make marathons look like a walk in the park. We’ve added a ‘Brownlee meter’ to try and put just how tough these races are into context, but beware; this is all relative and even the lowest rated events will require lots of training and superior fitness levels. <a href=https://www.craigmanor.co.uk/are-you-tough-enough/ ><img src=https://www.craigmanor.co.uk/wp-content/uploads/2016/06/13.jpg alt=”Are you tough enough” width=”450″ /></a><br /><a href=https://www.craigmanor.co.uk/are-you-tough-enough//&gtAre You Tough Enough?</a> by <a href=https://www.craigmanor.co.uk/>Craig Manor</a>. <a href=https://www.craigmanor.co.uk/are-you-tough-enough/ ><img src=https://www.craigmanor.co.uk/wp-content/uploads/2016/06/13.jpg alt=”Are you tough enough” width=”995″ /></a><br /><a href=https://www.craigmanor.co.uk/are-you-tough-enough//&gtAre You Tough Enough?</a> by <a href=https://www.craigmanor.co.uk/>Craig Manor</a>.